From a distance the wing tips of thirty thousand migrating fowl turned the sterile blue sky white with specks of black. This was the scene as dots hovered around a cyclone of geese that carried the mass from the wintry South Dakota landscape all the way to the stratosphere. The problem was that the birds weren’t sharing the same field with us. Those first frustrating hours spent tucked inside a ground blind next to 1,200 decoys were precursors for action that came wave after wave until our shoulders ached. Days of piling up Snows and Ross geese are the ones we remember and anyone with a shotgun and a little extra money can do it. 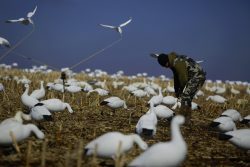 Getting snow geese to drop in on your spread means finding the flocks and getting as many decoys as you can on the ground before they come back. You’ll need help if you don’t use an outfitter so bring a buddy who is willing to knock on doors and spend the better part of normal sleeping hours setting up a spread that will fool birds who have seen it all. As a general rule, the more decoys there are in your spread the better it will be. But no matter how you set it up there is a good chance that the lowest flying geese will be over the area of your spread with the most movement. 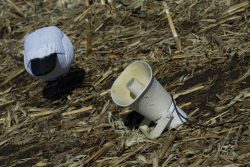 Battery powered bouncers are an excellent choice but other non- motorized moving decoys can work effectively. The point is to get movement in your spread and place your portable blinds within 10 yards. Don’t forget that birds like to land with their wings into the wind but also remember to position yourself to shoot when geese are close. When it comes to calling nothing beats amplified callers (legal in South Dakota) although when you are laying under two thousand circling geese it’s hard to hear anything. Do it yourselfers need to bring as much gear as they can and plan to spend a day or two locating flocks of geese in fields before setting up. Land owners, especially the ones with crops are usually happy to let you hunt. This holds true all throughout the migration routes of these birds that have reached nuisance status in much of the country. Portable lay out blinds that blend in are necessary. With thousands of eyes looking at you it won’t take much to flare a few hundred birds with glare from the ground. It’s important to know that geese will start flying north in late winter and you’ve got to intercept them on their way. 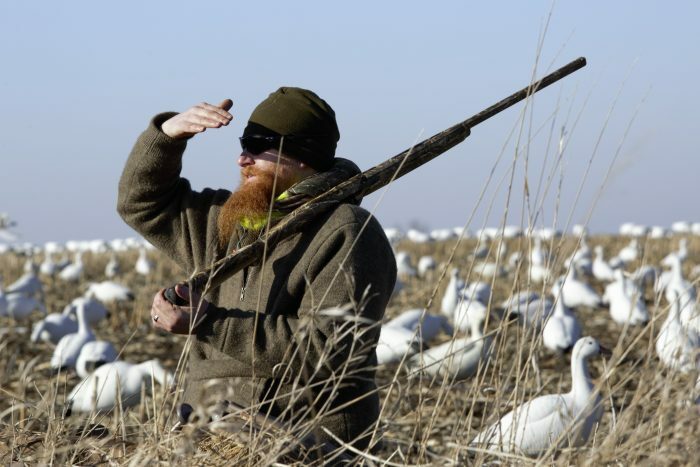 “Geese follow the snow line, where ever that is” says Dan Hogfoss, Owner of Goosehog Outdoors. And Dan should know, for over a decade he has followed the snow goose migration from Arkansas to the Canadian border and back every year. If DIY isn’t appealing or all your friends are too lazy a reputable outfitter like Dan is the way to go. 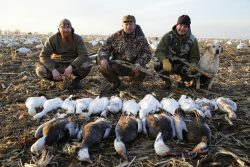 There are outfitters who can put you on birds when they come through their area and then there are guides who will get you in front of geese all season long regardless of which state they are in. 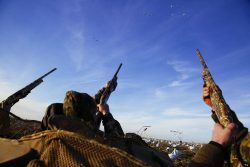 If you’re dreaming of watching the sky rain geese affordable hunts are available but buyers beware, find an outfitter who is willing and able to follow the migration from state to state and has a reputation for keeping hunters in front of birds. Good outfitters will have a reputation in the business and should have a long list of references for you to call. 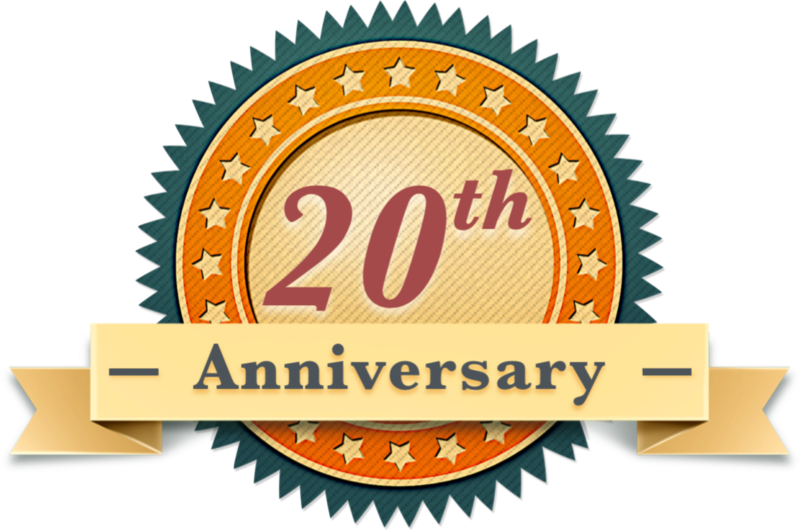 If you aren’t seeing references on the websites and the outfitter can’t or won’t give you some phone numbers I suggest calling a different outfitter. While you can’t always rely on photos as accurate depictions, one thing I look for is a good number of photos on the outfitters webpage. Those photos should have one or two guides who always seem to be in the mix with different hunters. Even in this day and age of social media and video feeds nothing beats a phone call to the outfitter. Ask questions, hear the voice of a real person and develop a relationship with them. This is one of the most important aspects of choosing a guide that we are losing as sportsmen and that is a huge mistake. Pick up the phone.